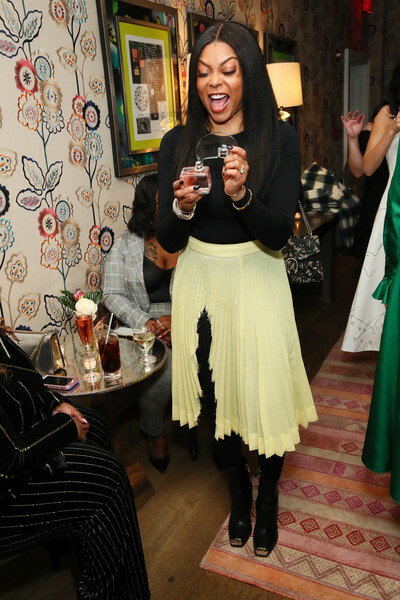 Taraji P. Henson, holding Calvin Klein Women fragrance, attends the InStyle Badass Women Dinner Hosted By Taraji P. Henson And Laura Brown on February 02, 2019 in New York City. Taraji P. Henson styled her outfit with a pair of metal-tipped ankle boots, also by Calvin Klein. Taraji P. Henson attended the InStyle Badass Women dinner wearing a long-sleeve black bodysuit by Wolford. Taraji P. Henson brightened up her black top with a distressed yellow skirt by Calvin Klein.